I did a story a few weeks ago about the fact that private citizens were outlawed from carrying guns into Sarah Palin speaking events. I decided to keep on the same topic and investigated the rules around firearms at the recent Conservative Political Action Convention held at the Marriott Wardman Park Hotel in Washington D.C. I wondered what the response would be from the people who run security at CPAC if attendees wanted to bring their firearms to the event, either with a legal concealed carried gun or a open carried gun. I called the the person in charge of CPAC at the Marriott Wardman Park Hotel who referred me to the person in charge of security. Instead of hearing from him, the next day I got a phone call from the District of Columbia police: Homeland Security Bureau, Special Operations Division, Special Events Branch. The nice officer from MPDC-HSB-SOD-SEB wanted me to know that attendees should not bring their guns to CPAC. He also explained there is no civilian firearm carry permit in D.C. The District of Columbia also doesn’t have reciprocity with other jurisdictions. So some congressman from Florida who got himself a gun, couldn’t bring it to CPAC. If he did, he would be arrested. Right wing politicians and conservative pundits will publicly tell their supporters how much they love all guns and would never infringe on the rights of anyone to own any firearm or bring it anywhere. But when it comes down to their own lives their actions are clear. GLOCK BLOCK! “Keep guns away from me, even if my security people have to pry them out of my supporters hands at the doorway of the venue.” They actually listen to the people they pay to keep them safe–and that involves sane, rational gun control. One thing that I’ve learned in writing on this topic is that the media will not report on this sane, rational gun control bubble that surrounds everyone at CPAC. There are a few reasons for this. The security professionals ask them not to write about it. The professionals don’t want to reveal any details to the media in case bad guys will use it to compromise security. That is one reason that I write and publish these stories after the events are over. They don’t want the “more guns make us safer” crowd to swarm them and petition to bring their guns to the event. The people who believe that their 2nd Amendment rights are infringed when they can’t bring their guns to an event are much more apt to complain than people who think the policies make sense. The professionals know that wading through a crowd of heat-packing amateurs who think they are in Deadwood is a recipe for disaster. The media know that even asking a question about guns around a conservative politician gets a massive security response. The massive contrast between what conservatives say about guns in public venues and their actions at the venues is very clear. 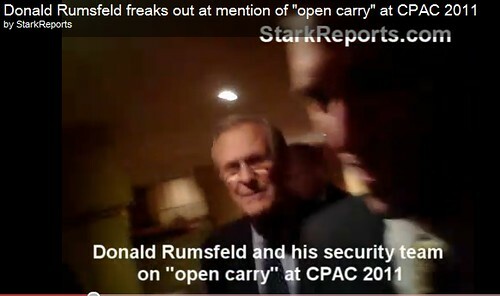 How do you think the guy who brought an AR-15 to an Obama event would fare at CPAC? He would never make it from the parking lot to the building before he would be hustled away. His removal from the venue would be blessed by both the CPAC organizers and Marriott security. Folks like NRA EVP Wayne LaPierre said at CPAC, “the presence of a gun in the hand of a good person makes us all safer.” But on the ground it’s hard to know who is a “good person” so the professionals opt to remove the need to make that judgment call and say, “No civilian guns.” I think that is a very good policy. If people have a problem with it they should take their complains to the security professionals. The experts will tell them to go pound sand and remind them that if they try to bring their weapon to the event anyway they will have them taken away. As I was working on this story and thinking about the issue of guns at political events I spotted this chilling video shot at a Phoenix gun show two weeks after the Tuscon shooting. The group Mayors Against Illegal Guns had an undercover investigator buying the same type gun and high capacity magazines used by Jared Loughner. The firearms were purchased without having to go though a background check. Here’s the video of an investigator buying a Glock and magazines without a background check using the gun show loophole. But nobody could carry out such an interesting visual action because of the still sane gun control policies in D.C.
CPAC organizers made a good decision in favor of gun control by putting the convention in the District of Columbia and in the Marriott. It’s a good thing they took the NRA’s money but ignored any demand to allow guns in the venue, see how LaPierre explained the “mix up.” The District of Columbia laws and the Marriott policies not only protected CPAC attendees from the firearms of their followers, they protected them from having to confront a damning visual reminder of their failure to to prevent the next Jared Loughner. One of the reasons that conservative politicians and right-wing pundits will not carry through with their views that, “more guns make us safer” at their events and speaking venues is because of the professional security infrastructure that quietly ignores their nonsense. Security professionals don’t bow to the “guns everywhere” pronouncements of their protectees, especially when it comes to the serious business of life and death. Will we see NRA-loving politicians demanding to only speak in venues where guns are welcomed and encouraged? Will they demand that their friends and family businesses stop being gun free zones and start welcoming more firearms on their premises or will they hide behind the very sensible gun control their security people demand? Who will be the next conservative to proclaim their love of guns to appease the radical NRA leaders in public yet Glock Block when it comes down to guns in their real life events? I’ll keep checking and report back.